This adorable cake holds a secret inside–will mama tell daddy to cut into the side with pink filling or the side with blue filling? What will it bee? As a child, I was always fascinated by magical things, especially magical things on a tiny scale. The Borrowers and the Ralph S. Mouse series were my favorite books specifically because of the scale. Even writing those titles creates a gentle, warm happiness inside me. I loved the idea that there could be this teeny tiny world around us, invisible to anyone who didn’t know where or how to look, where ping-pong balls could be repurposed as motorcycle helmets and matchboxes repurposed as boats. 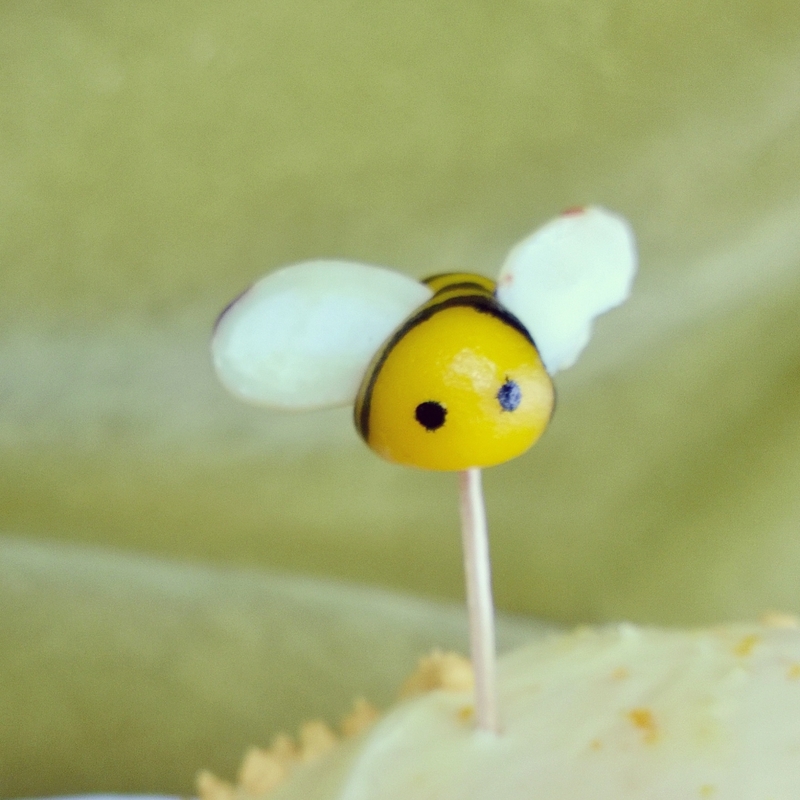 Marzipan bumblebees guard the secret of this gender reveal cake. I also loved the idea of woodland creatures that could communicate and faeries that practiced a sort of benevolent magic, supervising our bumbling, oversized world and helping us along here and there. 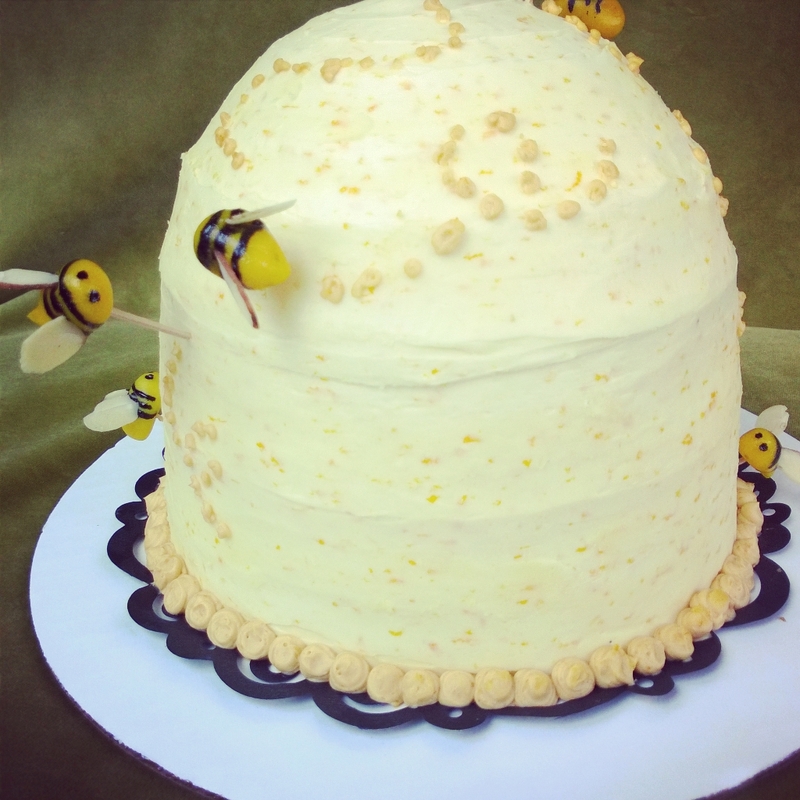 So when I received a request for a very special cake that would reveal the gender of a baby-in-the-making, and when it was requested that it be shaped like a beehive that asked the mischievous question “What will it bee?”, it awoke in me that child-sized traveller-from-long-ago to a separate world of magical whimsy. Because of course bees would know things like this, right? We don’t talk about “the birds and the bees” for nothing, right? As we wait for the sweet spark of a child to grow until it’s ready to join this earthly world, it is absolutely a time of magic so impressively powerful that yes, surely woodland creatures stealthily surround us, bearing the most wonderful secrets. 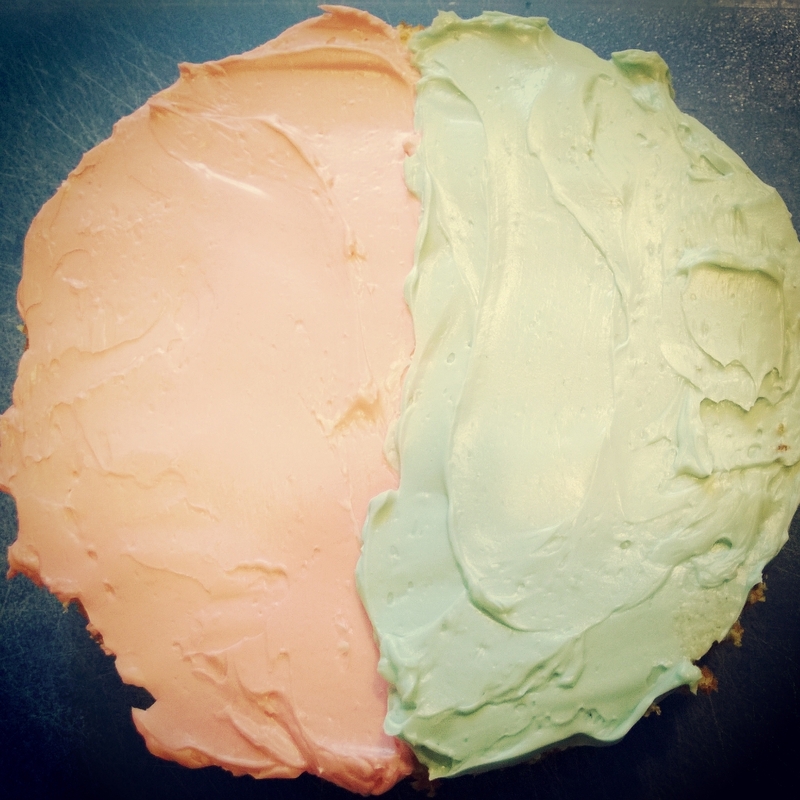 With a hemisphere of pink and a hemisphere of blue, this cake allows mama to direct daddy which side of the cake to cut into, revealing the gender of the baby on the way. What will it be, indeed? A boy or a girl? Will Mama instruct Daddy to cut into the side of the cake with pink filling or blue filling? And as Mama enjoys the sweetness of the vanilla cake, with either pink or blue vanilla buttercream filling and orange buttercream frosting, will that sweetness travel through to Baby, making Baby smile at the very beginning of “being known”? What will it be, indeed? Smart and funny? A deep thinker and compassionate human? An active, tumbling, laughing, joyful child? Brave and adventurous? Shy and tender? Pregnancy is a magical time of endless possibilities. As we wait for this child, love deepens and anticipation flows like a mighty river through our hearts, rising and rising until the birth, when we are overcome by a wave of love like we have never known before, beginning our new journeys as parents, as children, as families. The landing locations of 4 special bees hold the secret to the filling inside. 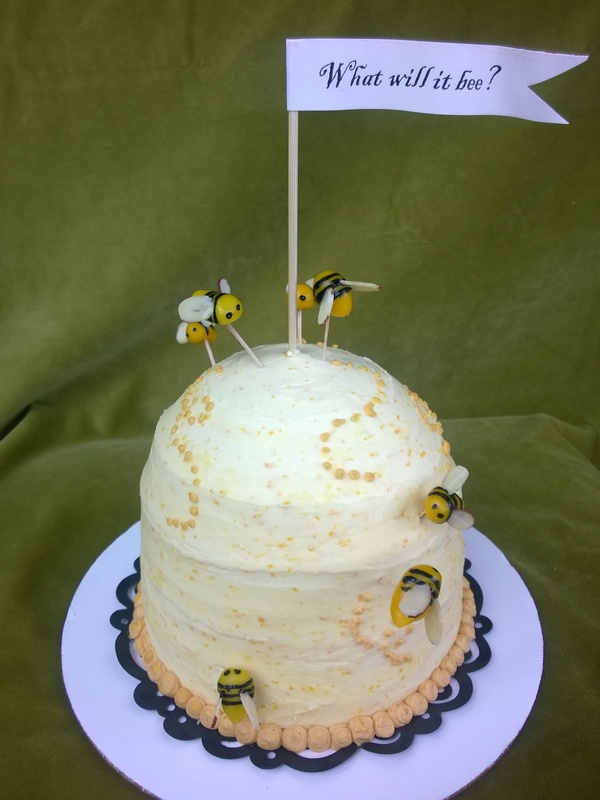 Draw an imaginary line from one of the lower bees through the cake to the other bee to mark the “equator”; the pair of bumblebees midway up the cake denote that they’re on the “boy side”. Cut accordingly! I love making cakes for people because they are often the centerpieces for such happy occasions, this being a fine example. Certainly this is a cake, but it is not just a cake. It is a magical holder of secrets that comes in the form of a vanilla cake with separate hemispheres of pink and blue vanilla buttercream filling, frosted with orange buttercream, built in the shape of a hive which has attracted a small family of adorable marzipan bees who circle a pennant from a woodland faery world where bees really can find hives that carry our most exciting secrets. Whatever it is, whichever side is cut into first, it will be wonderful and magical and perfect. Congratulations to Mama and Daddy and Baby–best wishes for the impending beginning of this new, fabulous journey. 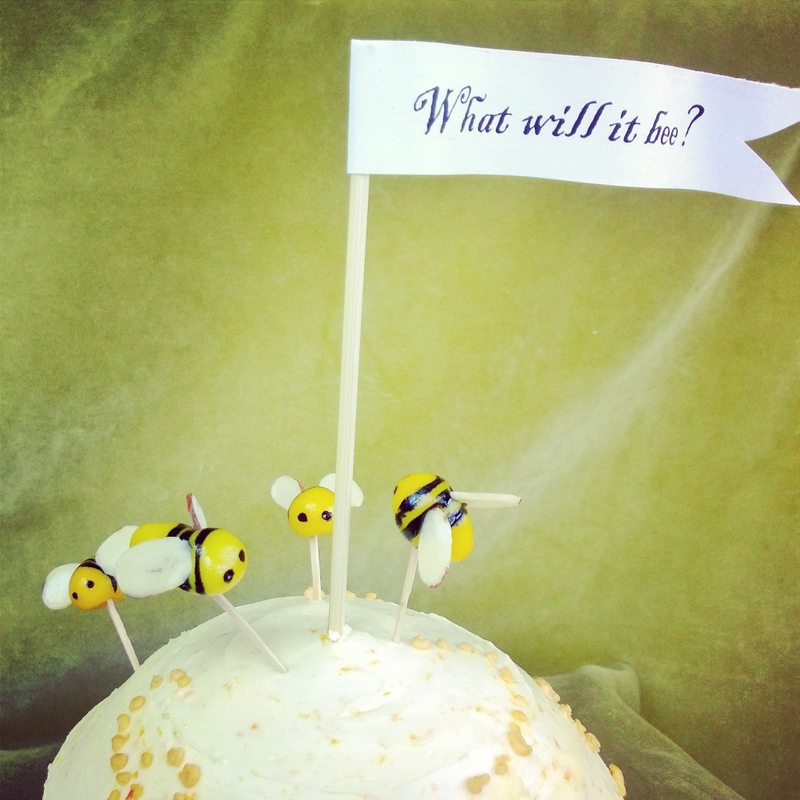 On this gender reveal cake, these busy bees circle a pennant asking a mischievous question: what will it bee?